If you think about a wonderful view to the ocean.... that is the place! A vivenda "Casas da Arriba N3" fica num local sossegado, a cerca de 600m da praia, no ponto mais alto da Praia da Areia Branca. Uma vista fantástica sobre o mar, com piscina privativa. Uma casa ampla e confortável, com decoração moderna. Modern Villa spread over three floors having a mixed classic construction using some granite and modern with contemporary furniture design with a large living room and fantastic view to pool firstly and to the ocean sea. Set on the hilltop of the village of Praia da Areia Branca (White Sand Beach) “Casas da Arriba” (houses of the hilltop / Cliff houses) is located at the top of the village, within peaceful green surroundings and having a nice view over the village to the beach and a spectacular sunset over the sea. “Casas da Arriba” is at 7 to 10 minutes walking down to the “Praia de Areia Branca” beach (around 500/600m). “Casas da Arriba N3” Villa is spacious and feature modern décor. With a large LED Televison and Free Wi-Fi access. Free parking available. The main entrance is at ground floor level with: (a) modern full equipped kitchen with dishwasher, oven, and microwave; (b) a spacious and comfortable dining and living room opened to the outdoor swimming pool with complete amenities; and (c) a service toilette. Bedrooms are located at the 1st floor and are well-equipped: (a) suite bedroom (2,00x1,60m bed) with a fantastic view to the sea and having a balcony; surrounded by a chest of drawers and a sofa, an en-suite bathroom with bathtub and washbasin for being used simultaneously by two; (b) bedroom Q1 equipped with a double size bed (2,0 x 1,6 m) a closet and a sofa; Q1 has access to a balcony where the sun shine could be appreciated; (c) the third bedroom (Q2) is equipped with two individual bed and a closet; (d) both bedrooms (b and c) are served by a bathroom with bathtub and has nice view to the ocean. Hairdryer available. At the basement there is an open space with a reading and living and a recreation area with a Snooker table. One complete bathroom with shower and toilette and a full equipped laundry (washing machine, dryer machine, iron table and iron etc…). "Casas da Arriba N3" Villa has a wooden deck terrace around the pool and is equipped with garden furniture and sun loungers. A Patio for the removable barbeque is available near the kitchen. A BBQ grill with wheels is available. Guests are welcome to cook their own meals, enjoying the magnificent spaces. Guests should do their own shopping on local market (there is a fresh food market, a grocery and bakery at around 500m away) or may go to Lourinhã, the closest city 3,5 km away where supermarkets are available (Lidl, InterMarché and Pingo Doce). And Now close, a few kilometers (about 10) from the "Dino Lourinhã Park", one of Europe's largest dinosaur theme parks ... not to be missed ... especially if you have younger children! Achei o local maravilhoso e com uma vista fabulosa para o mar e perto da praia. Tentei criar um espaço interior confortável, bonito e moderno. Agora perto, a poucos quilómetros (cerca de 10) do "Dino Parque da Lourinhã", um dos maiores parques temáticos de dinossauros da Europa...a não perder... principalmente se tiver filhos mais jovens! 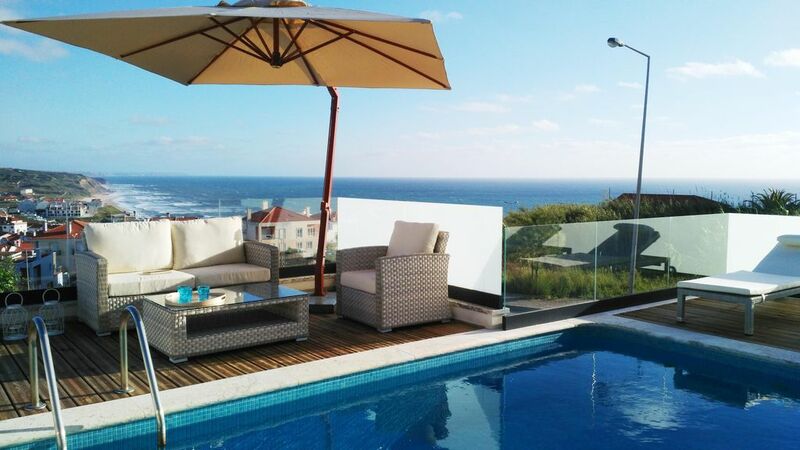 Localização; espaço interior confortável; vista espantosa sobre o mar ao acordar, .. o prazer do final de tarde sentado à beira da piscina a olhar e ouvir o mar, embora a localização seja no alto da colina, a cerca de 500/600m da praia. WiFi available for free. WiFi disponível grátis! Pwd na base do router (etiqueta de fábrica). O acesso a cadeiras de rodas é limitado ao Rés-do-chão, onde não há quartos nem casa-de-banho completa. O acesso à cave pode ser feito pela porta da garagem, indo pela rua mas também aí não existem quartos. The villa is exceptionally well equipped, furnished and decorated throughout. It is beautifully clean and modern and has a real luxury feel. The pool is great and the sitting area and barbecue are also excellent. The position of the villa provides a nice view down to the main beach, although at this time there is some building going on that interferes with the view a little. The main beach is fantastic, not too crowded, nice sand and great waves every day for bodyboarding. The second closer beach is really beautiful and secluded but be ware that there are some rocks in the sea that make it unsuitable for bodyboarding. Great place to watch the sun go down. Couple of good restaurants in the village and supermarkets only a few mins away. There isn't a huge amount to do in the area but we were more than happy to spend time relaxing at the very comfortable villa and playing in the sea at the great beach. The owner, Carlos, is very warm and welcoming. I have given this review 5 stars, I would knock off half a star just because there was some building work around the villa that temporarily detracts a little from the experience. Many thanks Carlos for the use of your exceptional villa. Thank you very much for the comments about the house. Guests like you contribute to maintaining and adapting the space ..
Our family had a wonderful stay in Praia da Areia Branca. This villa is beautiful. Very spacious 3 bedroom 3 bath villa with amazing views of the Atlantic ocean and beach. The sea village has several great restaurants overlooking the water. It is a quiet community but close to so many wonderful cities and towns to visit. We drove to Lisbon, Sintra, Cascais, Peniche, Obidos and Caldas. Great day trips and we were back to relax by the beautiful pool before dinner each night. We would highly recommend this villa. Carlos is a wonderful host and was just a phone call away. We will be back!! Beautiful house, spectacular location and fabulous owner! This was quite the best holiday as Carlos was a fantastic host and the house is truly amazing. You have to stay there to know how brilliant it is. We spent our holliday in August 2017 with a family of five in this practical new, spacious and well equipped villa of Carlos. Carlos is a perfect host, who has given us a warm welcome and all the assistance and help we needed. The Villa is lying on the highest part of the village, which gave us a perfect view over the village, the beach and the ocean. Close by the Villa (5-10 minutes walk, with a rather steep descent ) there is a small beach which is not guarded but was our favoutite because the more or less private character of it. We had to get used to the climate: rather fresh and damp in the morning followed by a sunny afternoon. The fact that the temperature was not that high we experienced as pleasant. The house, the pool, the view, the facillities, the euipment and all was perfect!! Nice to spend half a day with kids.